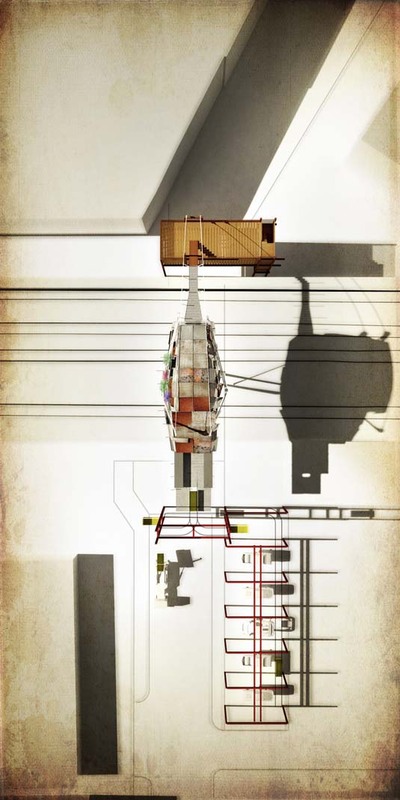 [Image: The "Situationist Drawing Device" by Ji Soo Han and Paul Ornsby]. The "Situationist Drawing Device" is a backpack-sized mechanism for recording the experience of landscape. 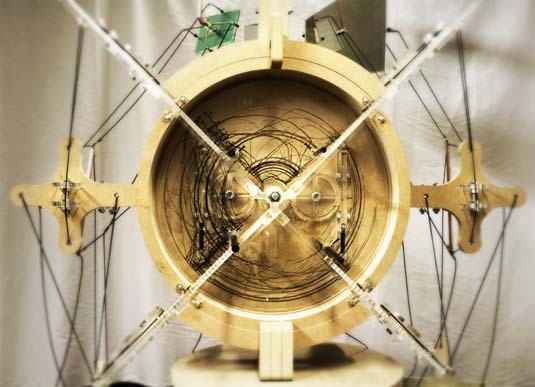 Designed by Ji Soo Han and Paul Ornsby, and operating by way of mirrors, the Device "records a journey taken in an altered state of perception through drawing." It is an "intermediary and interpretative tool," the designers add, one that stands between the human body and the landscape it exists within and explores. 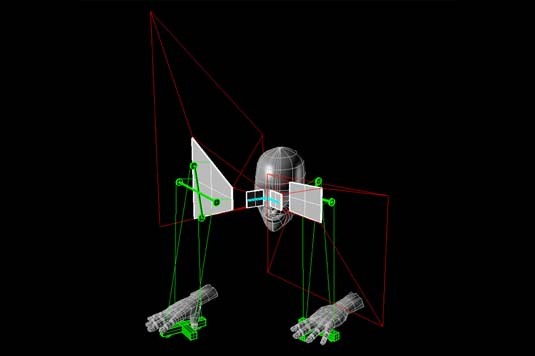 It is spatial equipment—an optical exoskeleton. Navigational clothing. 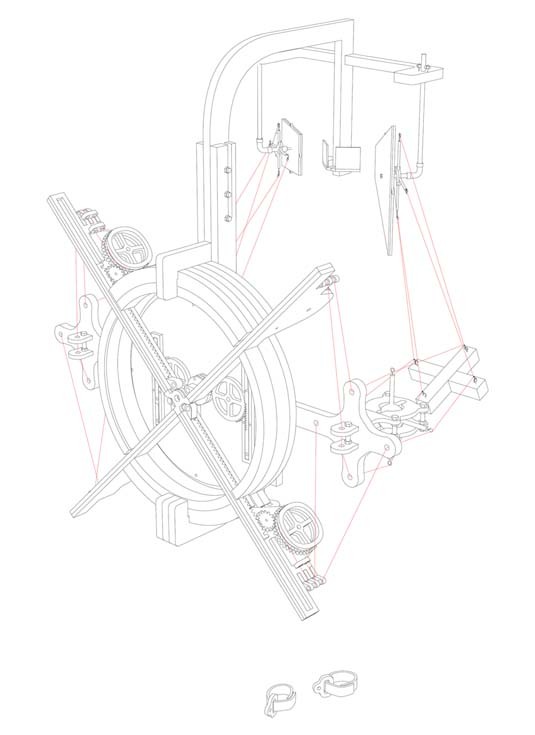 [Images: The "Situationist Drawing Device" by Ji Soo Han and Paul Ornsby]. "As each eye retina receives different images, both conditions blur into one and simultaneously alternate—phasing in and out over the other," the designers write. "This blurring effect, as known as retinal rivalry, creates a new perception of the site. The device was initially adapted from the pseudoscope (Greek, false view) which is a binocular instrument that reverses depth perception. The idea of reversing left and right eye vision was adapted to reverse forward and backward vision." You advance by looking backward, walking into layered optical phantoms of the place you've left behind. It is both mnemonic and projective. 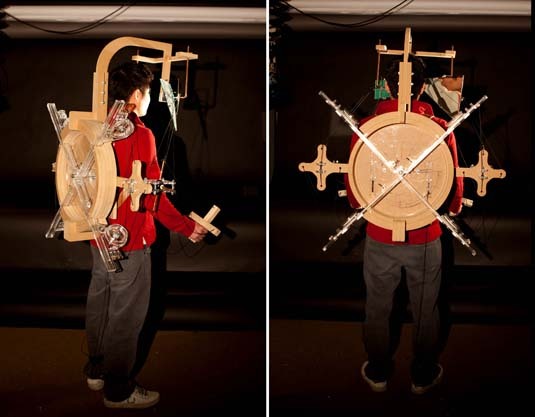 The key detail, though, is that the backpack also registers, through drawing, your experience of wearing it; a small, Iron Man-like disc (see opening image) on the user's back serves both to house and to produce those vaguely seismological sketches. It is a mystical drawing pad for upstart Situationists. 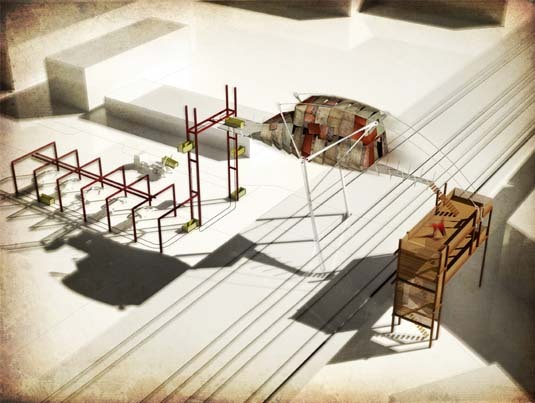 The device later inspired Han to design a project called the "Scrap Metal Refinery," a few images of which appear here. [Images: The "Scrap Metal Refinery" by Ji Soo Han]. That proposes a bridge that would stride across its own curved shadows and reflections, which are meant to be seen as a form of spatial notation, the structure registering itself in the landscape. 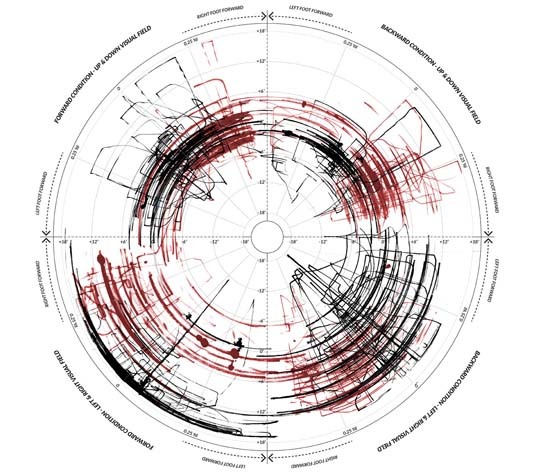 Devices have shared a long and complex history with architecture. 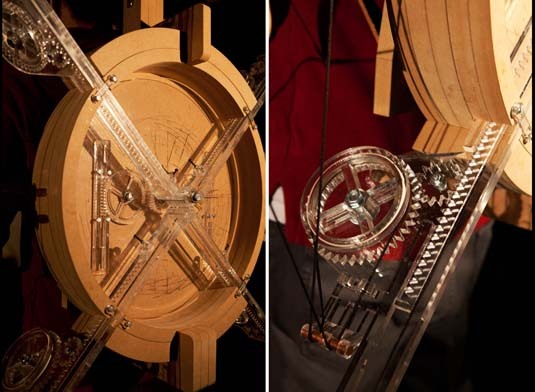 The machines of Vitruvius and Leonardo da Vinci were devised in times of peace and war for both the construction and destruction of the built form. Today, kinetic intelligent systems are incorporated into building facades for environmental and aesthetic control. The device, however, has simultaneously followed a parallel trajectory—the Victorians invented a proliferation of devices, often ingenious, rarely of much practical use; Heath Robinson's contraptions displayed the absurd length to which devices were invented to satisfy our convenience and curiosity; his illustrations, sometimes carrying satirical and political overtones, are best remembered for their humor. Similarly, many of today's devices no longer perform quotidian practical tasks but are the results of artistic endeavor and are housed in galleries and museums. 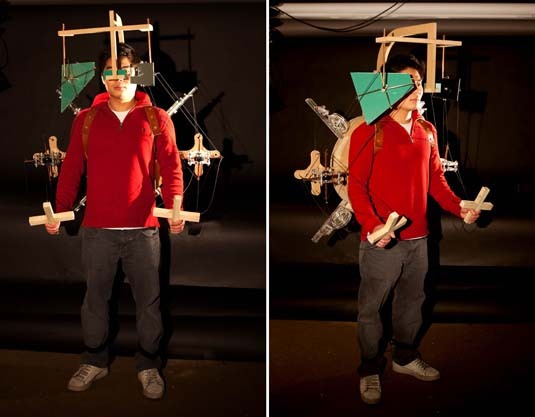 The "Situationist Drawing Device" is what happens when an unironic Vitruvian sensibility is crossed with the willful absurdity of Situationist urban exploration, by way of mirrors and pens: an unfeasibly complicated piece of clothing through which the experience of built space is memorably upended. Read a bit more at Ji Soo Han's website. This looks like some kind of extremely convoluted spirograph contraption that I would have loved to use back in junior high. Awesome! 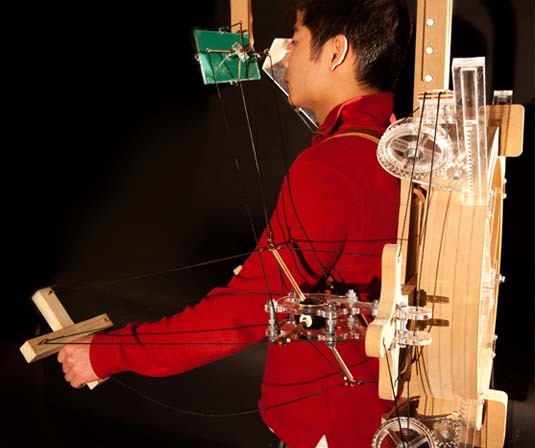 More relevantly, it seems like a contraption like this would not only encourage perceptive dissonance, but also overwhelming amounts of proprioception, especially since what you see and what you feel are going to be rather disjointed. Still awesome! 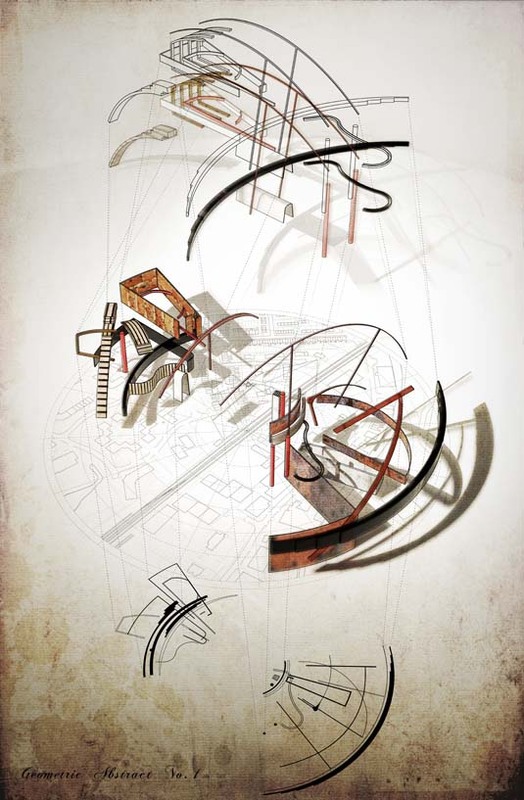 Secondly in a perverse way it also reminds me of Tatlin's flying bicycle which he always presented in a completely straight faced way as a serious proposition but it is almost impossible to see it as anything but a brilliant parody of the political failure of the Stalinist Soviet state. How he avoided the labour camps is a mystery I feel, one can only assume that the Stalinist bureaucrats were too humourless to even understand when they were being sent up - not that Tatlin could ever admit that it was a send up.